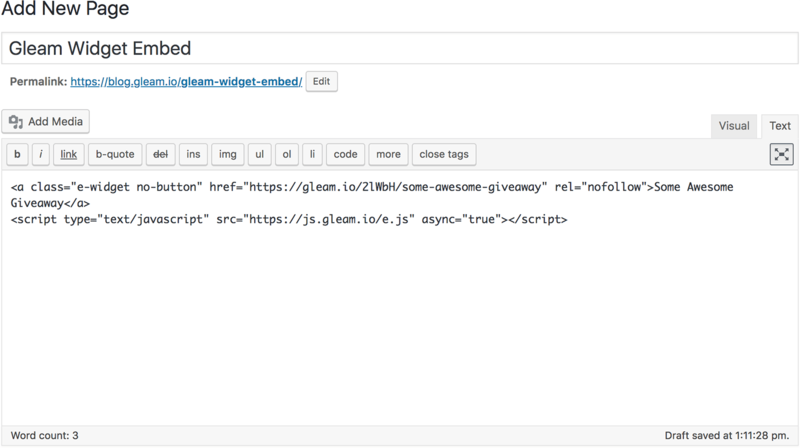 You have a number of options to install Gleam on your site, the most common is to embed inside a page or a blog post. This gives you the ability to run the competition on your own domain, or on the domain of a partner. There's no limit on how many sites you can embed your campaign on, so if you want to partner with other brands or influencers you can just give them your embed code. After you setup your competition you have the option to install in a way that suits your needs. This is the code you need to paste onto your page in order to load the Gleam widget. Depending on what CMS or blog platform you use where you add it may vary, we've added some instructions for common platforms below. When writing a post in Wordpress you need to paste in the Gleam embed code in Text mode. The code is built in such a way that switching back to Visual mode after adding it shouldn't break the widget. If you manually create a page you can paste in the embeddable widget code that you find on your installation options, you will need to make sure that you select the Show HTML editor to do this. To install to a WIX page you need to first Add > More > HTML Code then add your Gleam embed code into WIX. Once you do that you can drag the frame to ensure the widget fits properly within your page /design. To install to a post in Blogger you need to also select HTML mode, our script works in a way that you can freely move between HTML mode & Compose mode after you add it.